A partnership is a working relationship between two or more parties creating added value for the customer. It is defined as a relationship in which two or more parties, having compatible goals, form an agreement to share the work, share the risk and share the results or proceeds. It is a collaborative relationship between entities to work toward shared objectives through a mutually agreed division of work. It is the building of a sustainable relationship between the parties based on mutual trust, respect and openness. Excellent organization plans and manage external partnerships, suppliers and internal resources in order to support strategy and policies and the effective operation of its processes. They ensure that they effectively manage their environmental and societal impact. Strong partnerships enable organizations to do more than what they can do alone, become more diverse and innovative in their thinking and have the potential to reach a far wider audience. By sharing expertise, resources, and stakeholders, organizations that partner successfully are able to access new markets, spur innovation, and achieve greater outcomes. Entering into a partnership helps the organization with some added value that it cannot achieve in any other way even with the outlay in time, money and materials. Typical benefits can include reduction in time to market, first to market with new technology and reduction in costs. Partnership can avoid duplication of efforts, provide for pooling of scarce resources, and promote coordinated, focused and consistent mutual efforts toward achievement of organizational success as well as in the bottom line. A partnership can be a handshake (not a handout) with a written agreement between the parties with appropriate legal authority. It needs fairly equal participation of the partners and is to be consistent with the plans, policies and priorities of the partners. The partnership must include the agreement that outlines the parties’ mutual interest in, mutual benefits from, or mutually desired goals of a common objective related to the mission of the parties. The agreement is to demonstrate real benefits and is to be wholly owned by the partner organizations. The agreement is to have a realistic time frame with sufficient lead time to acquire funding, materials and necessary approvals. A partnership cannot be formed if there is a conflict of interest or appearance of conflict of interest or preferential treatment of one partner over another. Partnership is also not an endorsement of commercial products, services, or entities. The partnership is also not a way to get around laws that apply to the activities of the partners. It is also not the marketing or promotion of partners in any way, except for recognition of the contribution. Partnership may be formed with, amongst others, customers, society, key suppliers, educational bodies or nongovernmental organizations (NGO). The number of partnerships, alliances, and joint ventures has risen in recent years as organizations try to maintain a competitive advantage in a complex global marketplace. Recognizing the many benefits of collaboration, organizations are investing more resources in partnerships than ever before. The potential for greater realized returns through partnership does not come without risk. Partnerships may fail due to lack of organizational investment, insufficient leadership commitment, and dedicated resources. These hurdles are further exacerbated by complications such as undefined roles and responsibilities, poorly aligned capabilities, and cultural differences. Hence a structured approach is needed for managing the risks involved in partnerships, given the large investment of time and resources required to manage partnerships. Besides the structured approach, partnerships also involve hard work, and require commitment, planning, appropriate processes and policies, nurturing and compromise to be successful. For a successful partnership there is to have a formal agreement which outlines the specifics. The partners are to understand and respect each other’s organizational mission and culture. The agreement is to focus on the partnership need and is based on the shared vision. The partnership is to be owned by each partner organization. Resources base is to be available with the partnering organizations for the partnership. Also there is needed an effective monitoring and evaluation system of the work being carried out under partnership. 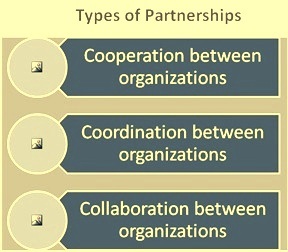 Partnerships can be of three types as described below (Fig 1). Cooperation between organizations – This type of partnership consists of mutually beneficial administrative and program relationships that may include sharing information, customers, space and other resources. It also includes relationships in which the organizations agree to work together on one or more areas of cooperation. Coordination between organizations – This type of partnership consists of deeper relationships built upon compatible missions, joint planning, division of roles and resources and consistent communication channels in which accomplishments are mutually acknowledged. Partnering organizations recognize the value in the relationship and begin to develop a supportive partnership infrastructure. Collaboration between organizations – This type of partnership consists of the deepest of organizational relationships, where documented expectations and a structure to achieve goals beyond those any individual partner could achieve are in place. In this partnership partnering organizations establish long term, ongoing operation of coordinated or cooperative activities and demonstrate continuity and long-standing trusting relationships. For successful partnership, there is necessity of building a partnership culture in the organization which incorporates the following success factors and the commitments from the organizational management and the employees. These success factors need development of the competencies and alignment of success behaviors of the employees with the requirements of the partnerships. Focusing on the need – To achieve some of the organizational objectives there is to be realization in the organization for the need of the partnership. Focus on this need is essential while selecting the partner and entering into partnership with him. For fulfilling the need, it is to be kept in mind that entering partnerships take time to establish and nurture in order to have successful outcomes. Making the partnership a win-win for the partners – Successful partnerships begin and thrive with a clear understanding that mutual benefits will accrue to the partners involved. Each partner may not benefit equally, but each must realize a value-added benefit which is to be seen as benefits gained alongside his contribution. Adaptation of a shared vision – Development and continuing refinement of a shared vision of the work to be accomplished is key to the success of the partnership. The shared vision should evolve from the full engagement of the partners. It must demonstrate a culture of full engagement from the very beginning that leads to collective enthusiasm and achieving results. Negotiation of a formal agreement – Partnership needs formal written agreements and work plans that define mutual interests and expectations, the roles and responsibilities of each partner, and clear accountability for the work to be performed. The formal agreement serves as a mutually binding contract to ensure that each partner acknowledges and fulfills his responsibility. This agreement can be kept flexible so that it can be amended or updated to meet the needs of change in the environment in future. Ensuring good communication – The success of every partnership is dependent upon the effective, trustworthy, open and strong communication. The structure, frequency, and quality of communication between the partners is very important for the success of the partnership. Owning of partnership – For the partnership to succeed, the management and all the employees of the partnering organizations are to accept and own the partnership. It must not remain as the work of a few people in the organization. There has to be collective efforts in both the organizations for the partnership for taking the advantages of the benefits of the partnership. Building of the trust – Building of trust between the partnering organizations is an essential ingredient for successful partnerships and enables collaboration and contribution. Trust must be built through the consistency and integrity of the actions over time. Trust must be demonstrated and earned through organizational actions. Sharing of power and control – For success, partnership must allow shared power, control and responsibility between the partners in spite of that one partner may have superior position in terms of resources. The organization with superior resources is to respect the partnering organization with inferior resources on equal footing. Respect for mission and culture of the partnering organization – It is important that the partnering organizations acknowledge, understand and respect the different organizational cultures of each other. The most successful partnerships recognize and value the differences and find ways to integrate them into a workable overarching partnership culture for strengthening of the partnership. Take advantage of the partner strengths – Successful partnership take advantage of the strength and capabilities of the partner for the accomplishment of the tasks in a cost effective manner. Successful partnerships are characterized by a flexible approach to how needs and responsibilities are matched given each partner’s strengths and weaknesses. Overcoming the red tape – Partnerships regularly face red tape barriers in trying to work across organization lines which tend to have more regulations. Successful partnerships acknowledge and address these realities up front and take satisfaction in resolving them. Partners are to overcome adversity and the institutional complexities of individual partner members for a successful partnership. Building of the partnership steadily – Aim to get early success is to be avoided in the partnership agreement since good partnerships take a steady investment of time and energy to build and develop. Successful partnerships are built incrementally by starting at the beginning, and growing gradually and tackling more complex initiatives based on the competencies gained from the previous efforts. Striving for excellence – A partnership gains stature and reputation based on the quality of the work it accomplishes. The successful of the partnership depends on doing everything well. The partnership built with excellence ultimately brings excellence to the organization. Assigning resources – The success of any partnership depends on the human and financial resources assigned to the partnership work in the partnering organizations. In the absence or reduction of the required resources the sustainability of the partnership is jeopardized. Team work and adaption of best practices – Teamwork between the partners and attitude of learning are necessary for the success of the partnership. Partners are to be always on the lookout for innovation and creativity that can be adapted to their partnership. Adaptation of best practices helps to accomplish the goals of the partnership. Ethics governing relationship – Sustaining successful partnership involves hard work which is practiced effectively and consistently over time and depends on how partners interact and work together. Accountability measures are necessary for good relationship. Honesty, respect, courtesy, tact, and diplomacy are necessary for governing partner relationships. Honoring of commitments – Honoring of commitment brings in mutual trust and faith, the two important factors for successful partnership. Right to disagree and consensus – If there are differences between two partners on certain issues then the right to disagreement is to be respected. In such a case decisions are to be taken on consensus. Right to disagreement must not become the cause for derailment of the partnership. Effective management – For successful partnership effective and dedicated organizational management with support and ownership from the top is necessary. A partnership is likely to be ineffective and unsuccessful because of the following reasons. Partners do not share the same values and interests. This can make agreements on partnership goals difficult. There is no sharing of risk, responsibility, accountability or benefits. The inequalities in partners’ resources and expertise determine their relative influence in the partnership’s decision making. One of the partners has all the power and/or drives the process. There is a hidden motivation which is not declared to all partners. The partnership was established just to ‘keep up appearances’. Partnership members do not have the training to identify issues or resolve internal conflicts. Partners are not chosen carefully, particularly if it is difficult to ‘de-partner’.